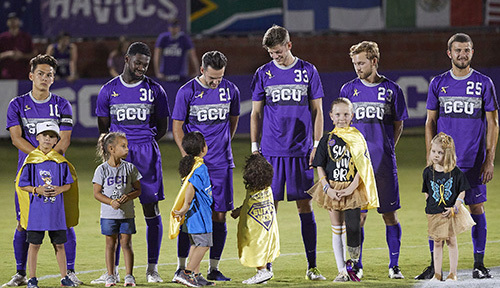 Children in the Phoenix community took a well-deserved break from their battle with cancer Friday night at Grand Canyon University Stadium. 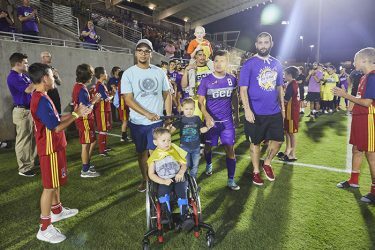 The children, parents and adult cancer survivors crossed the lines of the pitch at the GCU men’s soccer game to kick off Run to Fight Children’s Cancer, the largest fundraising event in Arizona dedicated solely to children’s cancer. Children with Run to Fight walk out with players for the National Anthem. The children were walked out by players for the national anthem, donning gold capes because they truly are superheroes. A few of the children also led the Havocs’ Thunder Clap. The ninth annual Run to Fight race is scheduled for March 16 and will feature a 10K, 5K and Cancer Survivors Walk. The honorary race starter for the day will be 6-year-old Gwen Satterlee, a Chandler resident who was diagnosed two years ago with high-risk acute lymphoblastic leukemia. 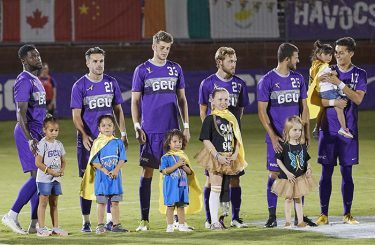 A previous race starter, 14-year-old Emma Kerr, led the Havocs’ Thunder Clap with her sister and last year’s starter, 4-year-old Lily Gray. Emma, whose leukemia is in remission, said she wasn’t the least bit nervous to lead the clap. She said hitting the drum was the most exciting part of the day. She did it with the confidence of a 14-year-old beating cancer. 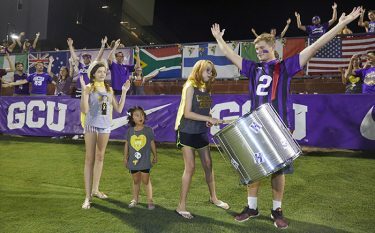 Emma Kerr (second from right) leads the Havocs’ Thunder Clap. Jackson Dupps, 7, was also at the race for his second-straight year. His mother, Kelli Dupps, said Jackson is five years cancer-free next month. He was diagnosed at 1 with kidney cancer. Dupps said she was very impressed with how the run last year was attended by so many students. She said the signs they made were extremely uplifting, and that Jackson remembers the moment. Children with Run to Fight stand with players for the national anthem. Another survivor, 29-year-old Robert Nicolau, has been attending the race since 2016 in support of his fellow warriors, young and old. Nicolau has been battling CML leukemia for eight years. He said the fight has taken a turn back in the past few months, prompting him to take four chemotherapy pills a day. But there is hope on the horizon. Doctors are searching for a stem-cell match for Nicolau. The transplant would be followed by more than a month of intense chemotherapy and radiation. Nicolau’s sister, Constanza Nicolau, is a half match for the stem-cell transplant and said she is more than willing to help her brother fight cancer if a full match isn’t found. The siblings’ mother, Vanesa Eacott, attended the race in support of her son and her best friend, who lost the battle with cancer. Eacott said that the family met a woman named Constanea Roberto when they moved to Phoenix more than a decade ago. The name, which bears bizarre resemblance to Eacott’s children, Robert and Constanza, was just the beginning of a great friendship between the two. But Roberto was diagnosed with cancer and died in Eacott’s arms in 2006. 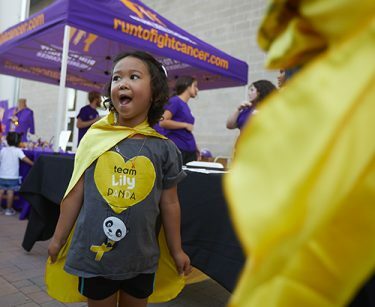 Lily Gray, the 2018 race starter, looks toward a crowd at the Run to Fight Children’s Cancer soccer game. Patti and Steve Luttrell, the executive director and board president of Run to Fight Children’s Cancer, started the event in 2011 to help families suffering through the battle with cancer like they did with their son, who was diagnosed with leukemia at 3 and has fought all his life to make it to 30. Last year, 2,300 runners participated in the race. Since its inception, the event has raised nearly $600,000 for families battling the disease. Click here to register for one of the runs and learn more about Run to Fight Children’s Cancer.